This fascinating exploration of a work that was the epitome of German literary modernism illuminates in chilling detail the death of the Weimar Republic's left-leaning culture of innovation and experimentation. 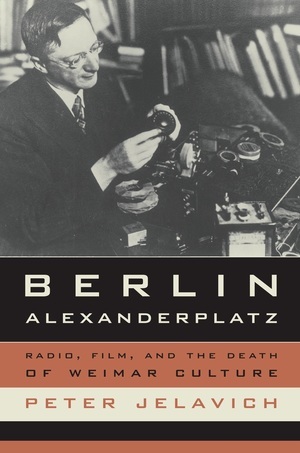 Peter Jelavich examines Alfred Döblin's Berlin Alexanderplatz (1929), a novel that questioned the autonomy and coherence of the human personality in the modern metropolis, and traces the radical discrepancies that came with its adaptation into a radio play (1930) and a film (1931). Jelavich explains these discrepancies by examining not only the varying demands of genre and technology but also the political and economic contexts of the media—in particular, the censorship practices in German radio and film. His analysis culminates in a richly textured discussion of the complex factors that led to the demise of Weimar culture, as Nazi intimidation and the economic strains of the Depression induced producers to depoliticize their works. Jelavich's book becomes a cautionary tale about how fear of outspoken right-wing politicians can curtail and eliminate the arts as a critical counterforce to politics—all in the name of entertainment. Peter Jelavich, Professor of History at Johns Hopkins University, is author of Berlin Cabaret (1993) and Munich and Theatrical Modernism: Politics, Playwriting, and Performance, 1890-1914 (1985).